Due to the massive blowout in budget, much of which is architectural in nature, we have put the build of this renovation on hold until later in the year (possibly October) before we revisit tenders for this job. Probably not an unusual dilemma we find ourselves in. We have to cut back down to a more manageable figure. 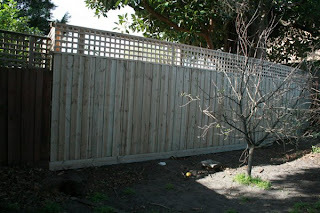 Our neighbour out the back has been over to discuss rebuilding the fence. 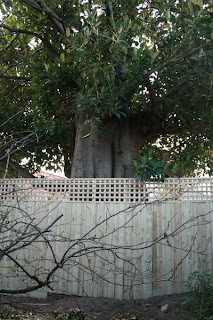 There has been neighbourhood discussions about the big tree out the back. 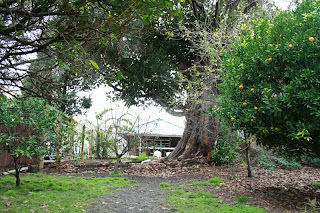 Some talk of chopping the tree down etc etc. But that is not happening, and probably not without council intervention. So the landscaper designer popped around to have a look at his blank canvas. 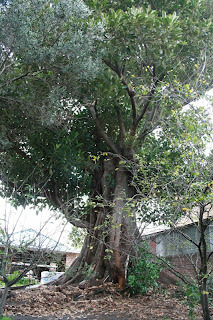 He gave us some food for thought regarding the Moreton Bay Fig tree growing at the back fence. He will have to take it into consideration as apparently it loves water, so therefore, anything planted nearby will need to be able to thrive without vast amounts of water, so it doesn't compete with the fig. I just want it all started already. I think next week I have to make a concerted effort to make some more decisions regarding the kitchen. 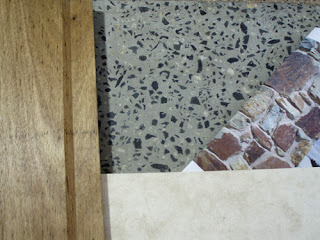 How hard could it be to pick a concrete floor? Well, you have to consider other materials that will be juxtaposed with it. Then you have to decide on the colour of the floor: grey? black? cream? white? orange??!! 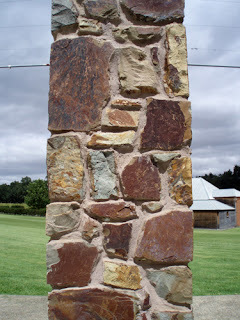 We went to Yering Station for lunch, and primarily to look at a stone wall there made of "Coldstream" or "Dromana" stone. This is proposed for our fireplace. Having looked at Mt Angus sandstone, we are leaning towards the Coldstream stone. 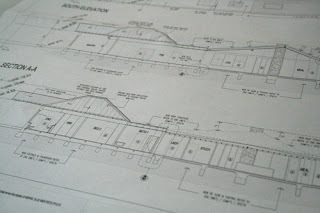 Today we went over more details pertaining to finishes and materials. 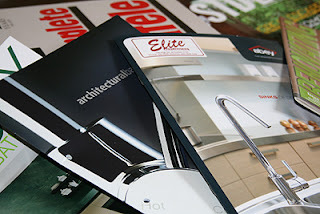 We're off to a tile supplier in on Monday. We decided to engage the landscaper of our choice. We also went to a house designed and built 2 years ago in the neighbourhood. Using similar front exterior finishes. But we went to see a stone wall that was installed there. Very nice (if a bit over whelming); luckily ours will just be cladding the chimney and fireplace. The owner also had some interesting comments in hindsight, about builders and architects in general. His feedback was quite good for the architect, however he said he wouldn't be recommending the builder. All very interesting indeed, and food for thought. 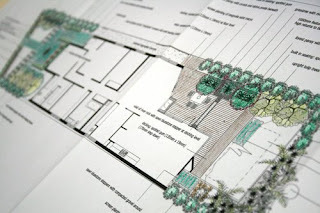 Well last Friday we met with a landscape designer at his office/showroom. He seemed quite nice. Very easy going nature, relaxed, comfortable with his work and not pretentious at all. And sounded willing to collaborate with the architect and will work to our budget. So we think we'll go with him. 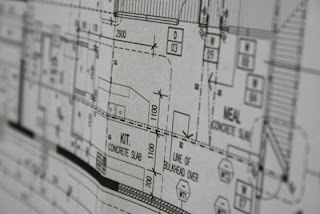 This Friday we have a meeting with the architect to, I guess, really set some of the plans in stone so to speak. I really haven't been running around sourcing appliances etc. Been a bit busy this week. I thought retirement meant you had more time, but my days are just disappearing all the time!